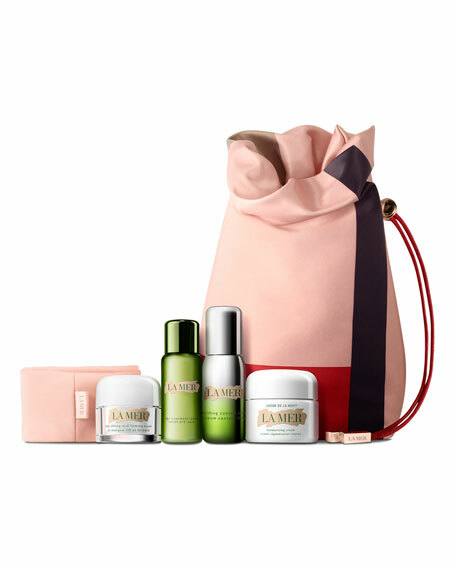 4-piece mini-regimen for indulgent, spa-inspired calm. This 4-piece set of transformative mini-treatments is a spa-inspired escape all its own. Fast-absorbing and super-hydrating, The Treatment Lotion optimizes your beauty regimen. The Lifting Contour Serum and the Lifting and Firming Mask leave skin looking more uplifted and firmer. Crème de la Mer is the finishing touch of healing moisture. Your regimen includes: The Treatment Lotion 30ml, The Lifting Contour Serum, 0.5 oz./ 15 mL, The Lifting and Firming Mask, 0.5 oz./ 15 mL, Crème de la Mer, 1.0 oz./ 30 mL and headband. For optimal results, apply your regimen in the following order: The Treatment Lotion, The Lifting Contour Serum, The Lifting and Firming Mask, Crème de la Mer. For in-store inquiries, use sku #2791088.